Each ornament details the age and gender of a gift recipient. Ornaments can be found on trees across the county, at City Market in Dillon, the Silverthorne Rec Center, Peek-A-Boo Toys and several other locations. Silverthorne’s Adopt an Angel program might be one of the largest gift exchanges across the county. While last year’s exchange helped provide gifts for 562 children, this year’s exchange will be even bigger. Silverthorne police sergeant Misty Higby said nearly 800 local children were registered through agencies such as the Family and Intercultural Resource Center (FIRC), Social Services and the Summit County School District. In other words, the department will help more than 300 families put presents under the tree. Individual donations and the help of a few local businesses drive the large gift exchange. 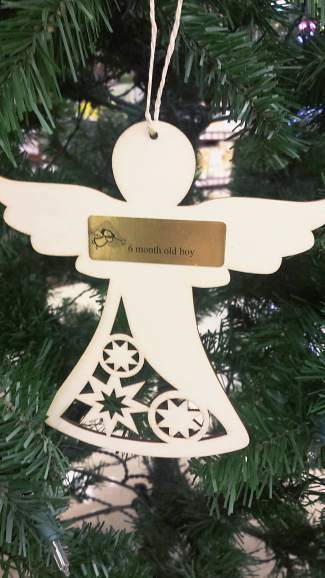 Throughout the county, stores will display a Christmas tree with wooden angels displaying the age and gender of a child. Summit County residents can pick up an ornament, purchase a gift and bring it unwrapped to local fire, police and ambulance departments. Both the “angel” and the gift must be delivered by Friday, Dec. 11. “Every year, it makes a difference in the type of Christmas kids are able to have,” FIRC development and volunteer director Anita Overmyer said. The age range for donations is from infants to 15 year-old-children. Once the presents have been gathered, they will be lined up in the Silverthorne Pavilion for parents of the approved families to choose from based on their children’s interests on Dec. 16. After the parents pick out the gifts, volunteers upstairs will wrap them and they can take them home to put under the tree. “It creates a positive bond with Fire, EMS and Law Enforcement with members of our community,” he said. In previous years, each child received one large present, sport equipment or a stuffed animal and an article of clothing, with clothing and books being in particularly high demand. But with this year’s numbers, that will be difficult to provide. The program is also supported by monetary donations, which can be made online or by dropping off cash or a check at the Silverthorne Police Department. Hanschmidt said the department used $3,000 to purchase new coats, snow pants, boots, hats and gloves on Black Friday. He added that the outlets had given them an additional 25 percent discount, and All Valley Storage provided a free locker filled with toys, bikes, santa suits and wrapping paper. With a large number of gift recipients this year, she said both donations and volunteers would be appreciated. The department will need volunteers to help families pick and wrap gifts the afternoon of Wednesday, Dec. 16. To sign up, call the Silverthorne Police Department at (970) 262-7320. “Whatever anyone is willing to do, we would gladly take,” she said.